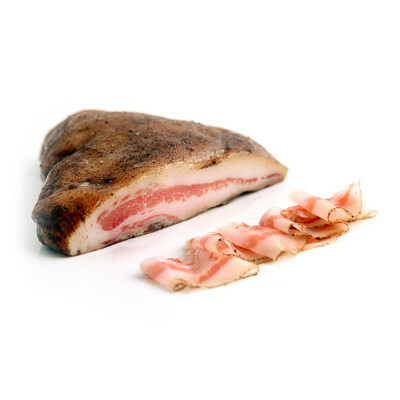 Guanciale is a cut of meat from the throat of the pig salted with herbs and spices, before leaving it to mature for about 3 months. 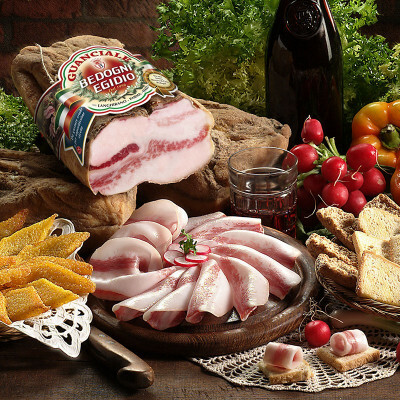 A deli meat with a characteristically dense consistency. A classic ingredients for two main Italian-recipes: Amatriciana and Carbonara pasta. Also try it with polenta or with truffle. Pork meat, salt, sublime drug, white pepper and garlic powder. 10 days as per vacuum pack regulation Freshly sliced and sealed in vacuum packed on the dispatch day.